Take a moment to listen to the “Return to Order Moment,” a short two-minute commentary on the burning issues of the day. These shows are based on the book, Return to Order: From a Frenzied Economy to an Organic Christian Society—Where We’ve Been, How We Got Here and Where We Need to Go. The first show deals with the question: What is true freedom? The Church teaches that freedom is not doing what you want without hurting anyone. On the contrary, freedom is all about virtue and self-restraint. Listen to the full two minutes by clicking here. This second show deals with the question: What Does Saint Thomas Aquinas Say About Immigration? Saint Thomas Aquinas was a great theologian of the church who lived in the thirteenth century. He expresses well the Church’s balanced position on immigration. The common sense of Saint Thomas may not be politically correct but it is extremely balanced and full of wisdom. Listen to the full two minutes by clicking here. 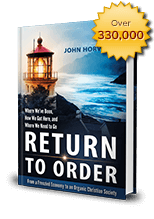 This entry was posted in Featured and tagged Audio, commentary, freedom, Return to Order, true by John Horvat II. Bookmark the permalink.